U.S. Rep. Charlie Crist urged members of Congress to extend protections under the flood insurance program. WASHINGTON, DC – U.S. Rep. Charlie Crist, D-St. Petersburg, took the House floor Thursday (Nov. 29) to warn Congress of the repercussions of allowing the critical National Flood Insurance Program to expire. 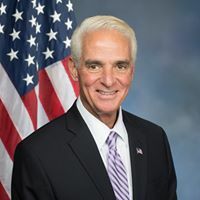 As a member of the Financial Services Committee that oversees the NFIP, Crist urged his colleagues to pass an extension and speed up work to secure a longer-term reauthorization, providing stability to homeowners and the housing market. “Thank you Mr. Speaker, and I want to thank Ranking Member Waters for her tireless leadership for a strong, affordable National Flood Insurance Program. “I rise today in strong support of the bill. “More than five million middle-class and working Americans rely on the National Flood Insurance Program for economic security and peace of mind. “Congress cannot allow this program to expire. “A lapse would leave countless families unable to renew their polices – putting them in financial peril if disaster were to strike. “It would also upend the housing market, with closings coming to a full stop due to the inability to secure required coverage. “And while I wish this bill included a much longer-term extension, providing American families with another week of coverage is far preferable to a damaging lapse. “But, my colleagues, we must do better than one week. “The people have endured seven stop-gap extensions, including two brief lapses, since September 2017. “Seven extensions. Fourteen months. The bill before us is number eight. “While almost everyone can agree that flood insurance is long overdue for reform – particularly to address the affordability challenges that plague policyholders – we should not allow that goal to threaten the program’s very existence. “I urge my colleagues to not only support today’s bill – but to work together in the coming days to reach agreement on a longer-term extension. For information about Crist, got to crist.house.gov. To watch a video of Crist making his statement, click here.